" . . . a lot of people live and travel full-time in an RV and many others dream of the day when they can, too. For most, it's a very good life. RVs are so comfortable now that it's easy to live in one, enjoying nearly all the comforts of home. And the freedom is incredible -- to go where you want, when you want and bring along your easy chair, too. It's a satisfying, stimulating life for people who yearn for adventure . . ."
When you've got an itch, scratch it. For us, that means getting back out on the road again in our camper for an extended trip across the country. 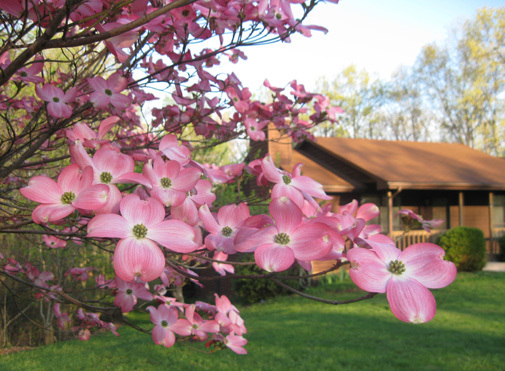 Although these forays are not without their challenges, they are certainly less stressful than maintaining our property in Virginia. After only eight weeks at our house, we're ready to travel again. Actually, we were ready mentally after only a couple days but there were lots of things that needed to be done there first . 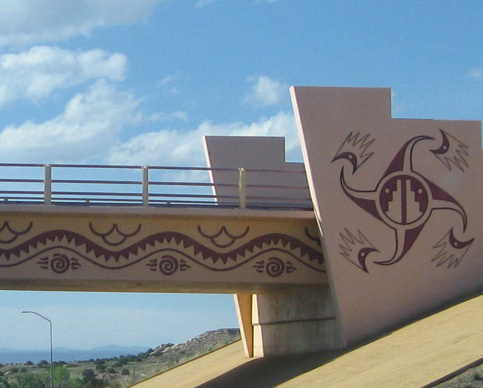 . .
After Jim signed up for the Jemez Mountain 50-miler in northern New Mexico we set a tentative date of May 9 or 10 to head west. Jim had a six-month dental cleaning appointment on the 7th and my last physical therapy session was set for the 8th. We ended up changing those appointments a few days ago when Jim talked me into hustling to get ready to leave on the 7th. The pressure!! His rationale made sense: he wanted at least a week in the Los Alamos area to get acclimated to the altitude and run/hike some of the race course. As you can imagine, the last few weeks have been hectic as we packed for our intended five-month journey, scrunched in as many physical therapy sessions and other medical appointments as possible, made arrangements for lawn care and mail forwarding and other "business-related" issues, reorganized important files that need to go with us, and tidied up the house and yard before our departure. Some friends and family members marvel when they consider the logistics of these extended trips, thinking about the difficulty of planning for even a one- or two-week vacation by car or plane. Each trip gets a little easier for us, though, and we don't have to be as discriminating in what we take since we have more room to carry it. We've pretty much learned what to leave in the camper between trips, although we don't want to spend unnecessary $$$ duplicating some items. Those go back into the house when we return to Roanoke and have to be carted back out to the camper each time we leave. It would be easier if we could leave some of our clothing in the camper 24/7 but Virginia's weather is too humid to allow that; the camper has more air leaks and clothes get too musty. Because our summer trips are usually at widely varying altitudes from a few hundred feet above sea level to mountaintops ranging up to 14,000 feet, we have to take a wide variety of clothes for cold, cool, warm, and hot weather. Even our winter trips have varied in temperatures by 70 degrees F. or more, necessitating both summer and winter "wardrobes." Since we can't take all of our clothes, we do get a little tired of wearing the same things over and over. Selection is critical. We have a master list of things we need to put back in the camper for each trip. We tweak that as necessary, depending on the season and our destinations. We've got that list so memorized that we didn't even consult it until the night before our departure this time, just to be sure we didn't miss something important. So far we haven't thought of anything we wish we'd brought. We probably will. We've also gradually reduced the amount of stuff we take with us, especially heavy canned foods and big bags of dog food. It took Jim a while to convince me that we're spending more on the extra diesel fuel it takes to haul items like that for 2,000 miles than it does to buy locally (usually at higher cost) when we arrive at our destination. Packing the camper is physically tiring but less stressful mentally than getting some of the other ducks in a row when we leave. This is a learning process, too. We've modified some potential problems for this trip so we don't have as many worries while we're gone. I mentioned in a previous entry that we joined a professional mailing service in South Dakota to reduce the problems we've had with getting our mail while we're traveling. Our local Virginia post office will forward all of our first-class mail to this service and we'll notify the company when/where to send our mail to us via general delivery or a particular campground. The same neighbor who has mowed previously will continue to mow our yard regularly but we've also asked another neighbor to help keep the weeds at bay. I worry about how awful they look while we're gone and dread having to spend weeks pulling them up each time we get back from our summer trips. We emptied the refrigerator and propped the doors open so we don't have to worry about food spoiling during power failures. Then our neighbor only needs to reset the timers on our lights if the electricity is off for several hours. We always turn the water completely off and turn the thermostat either down (winter) or off (summer). The attic fan Jim installed last summer still helps keep the house cool in the summer; we always keep the electric power on for the light timers. Each trip we learn and apply a few more tricks to keeping life simpler when living in two "homes." When we left in November for our winter trip to the Southwest it was snowing in the Roanoke area. Although we weren't concerned about freezing precipitation this time in May, we were concerned about the amount of rain we got the night before our departure. Driving in heavy rain isn't any fun, especially when you're hauling a camper. Because of rain the last two days before we left, Jim was unable to mow the grass one last time. That was frustrating. But at least we didn't get 8-10" of rain the past couple of weeks like some of the areas through which we passed that still had flooded creeks, rivers, and fields. Our first two days on the road were a mix of sun and clouds through Virginia, Tennessee, Arkansas, and Oklahoma; we didn't have to drive in much rain, but the humidity was oppressive. By the time we reached New Mexico on the third day, yesterday, we had sunshine and nice, DRY air. We also lucked out by being a bit farther south of high winds and tornadoes in Arkansas, Oklahoma, and Missouri on Friday and north of more high winds in Oklahoma on Saturday. Pure luck both days that we were in just the right place to miss the damage! We heard tales of overturned semi trucks and RVs on the freeways, which always unnerves us, but we didn't see any wrecks where we were. 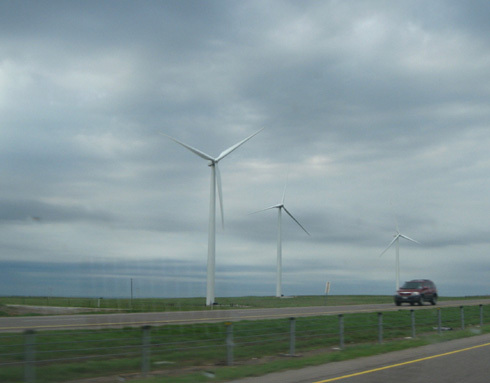 This area of the Plains is called "Tornado Alley" for good reason. During the 30+ years Jim worked for the Postal Service he had to spend several weeks at a time for updated training in the OKC area (Norman). Each time he had to go there in the spring or summer, he remembers hearing tornado warnings nearly every day. The first leg of this trip took one day less than we originally planned. 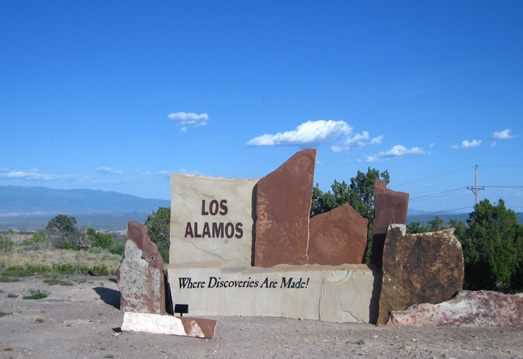 We arrived in Los Alamos yesterday afternoon after driving 1,737 miles in three days, from 567 to 596 miles a day. That's pretty good, considering we were towing a camper, going west into prevailing headwinds, and gaining a net elevation of over 6,000 feet. 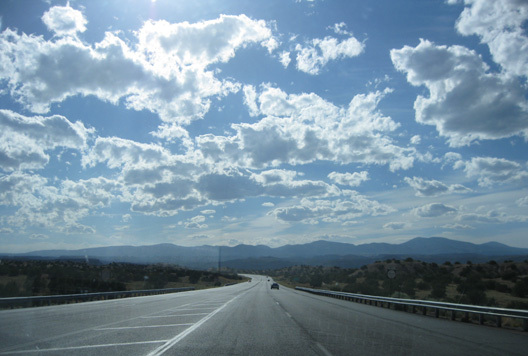 The main reasons we were able to tolerate three ten-hour days on the freeways were minimal road construction, mostly dry weather, and the ease and comfort of driving our new truck. Gosh, we never realized how much work it took to drive that F-250 until we got rid of it! The Ram powers our fifth-wheel camper up and down mountains just as well as the Ford but it does so much more efficiently, quietly, and easily. One big difference is not having to shift into and out of overdrive on every long hill; the Ram does it automatically in its "tow/haul" mode. The brake and accelerator pedals are also easier to use. Both trucks use diesel fuel but the Ram gets 3-4 miles per gallon better fuel efficiency than the F-250 did when hauling the camper. And that's carrying about 100 gallons of water in the camper because we boon-docked the first several nights of this trip! There's an even better differential when we aren't towing the camper. Better fuel efficiency plus much less expensive diesel prices than last summer, or even on our winter trip, almost make it a pleasure to fill up the tank each time. Almost. It's still our biggest expense of every trip. When Jim got diesel in Roanoke on the day before we left he paid $2.03/gallon. Prices ranged from $1.97/gallon (Oklahoma and southwestern Virginia) to $2.16/gallon (Arkansas) at Flying Js the last three days. They usually have the best prices we see, especially with the one-cent discount we get with our courtesy card (not a credit card). Flying Js are very convenient for RVers because we can also get potable water, fill our propane tanks, dump gray/black water, connect to WiFi, and stay overnight for free if we choose (on the quiet side of the building, opposite the semis and their pumps). The cheapest diesel we've seen in the Santa Fe/Los Alamos, NM area is $2.29/gallon. We figured it would be more expensive here. We expect prices will increase all over the country before Memorial Day and throughout the summer, but we aren't complaining. These prices are less than half of what they were last summer. We drove exclusively on freeways from Roanoke, Virginia until the middle of New Mexico: I-81 to westbound I-40 through Tennessee, Arkansas, Oklahoma, and Texas. 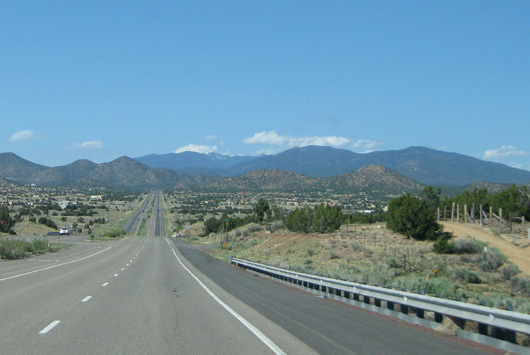 We got off I-40 at exit 218 in New Mexico and used US 285 as a tangent to Santa Fe, then NM 502 to Los Alamos. Both are good, fast roads, although on weekdays there is some construction on 285. We lucked out and missed that yesterday. We spent Thursday night in the nice, quiet Sam's Club parking lot in Jackson, TN, and Friday night at a Wal-Mart in the Oklahoma City area. Both were very convenient for shopping and freeway access. Now we're in an unusual campsite on the outskirts of Los Alamos. I'll describe it later. ***We love the computerized monitoring system (Electronic Vehicle Information Center) in an overhead console on our Ram. There are lots of useful trip functions and status displays. It shows our average gas mileage (it's pretty accurate), estimated miles left until the tank is empty, outside temperature, direction of travel, and other bits of useful information. We've never had that in a previous vehicle so it's like a new electronic toy to play with. ***We also appreciate having a free year of Sirius satellite radio programming to entertain us when we can't find local stations that interest us. We can take only so much of local birthday announcements, obituaries, and farm tractors for sale! ***It's fun to use our our Magellan GPS (nicknamed "Maggie") to find places like Wal-Mart and Steak 'N Shake. We often don't know which way to turn off a freeway ramp to find them if we can't see them from the road, but Maggie will tell us. Sometimes she gets our destinations wrong, however, and we've occasionally found ourselves in some tight spots with the camper in tow! I still prefer to supplement Maggie with a paper map or Google Maps/Topo software on our computer. ***Another feature of the Magellan GPS that I like is knowing our elevation. 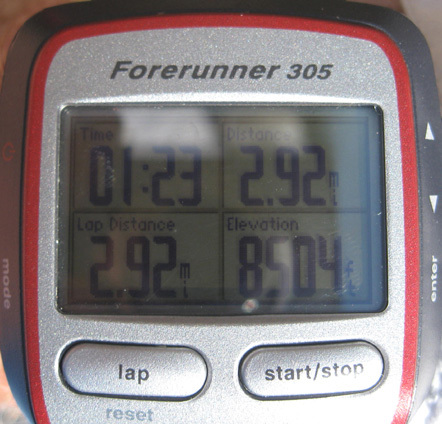 I'm always asking Jim the elevation when we're running together, too; he wears a Garmin Forerunner 305 wrist GPS, below, on his runs. I'm trying to talk him into getting a newer model so I can have that one. <grin> What can I say? I just like knowing the elevation, especially in mountains. ***On every leg of our trips I keep notes that are useful on subsequent trips, since we often return to the same areas of the country. I try not to be too O-C about it, but we often re-use information about fuel prices, freeway exit numbers and directions to various stores we use, road conditions and construction, miles we drove each day and how long it took, where we stayed overnight, etc. As with our master list of items to take on our trips, we've learned what information is helpful later on and what isn't. I just have to remember to take the relevant information with us each time! That's one small part of the "paperwork frenzy" we have before each trip. 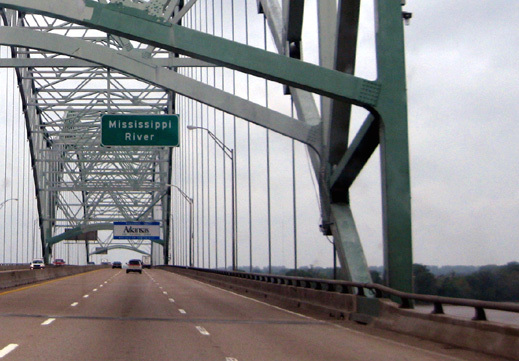 ***We occasionally hit some nasty, bumpy sections of freeway in all six states and wondered if there is less federal funding for road repairs during the recession. We were happy there wasn't much road construction to slow us down, however. ***Traffic seemed light through major cities on Thursday and Friday. Again, we suspect the poor economy. With high unemployment rates, it makes sense that there would be fewer commuters on the road. We sure saw plenty of RVs, though, even on those two weekdays. I think that's because of the lower fuel prices. ***Did you know Groom, TX lays claim to having "the largest cross in the Western Hemisphere?" No? We didn't think so. I love seeing signs for kitschy stuff like that along the freeways and blue highways across this country. If an area doesn't have natural features to draw tourists, just make up something unusual and promote that! We also saw lots of references to historic Route 66 ("The Mother Road") in Oklahoma, Texas, and New Mexico. We're happy to be in New Mexico! 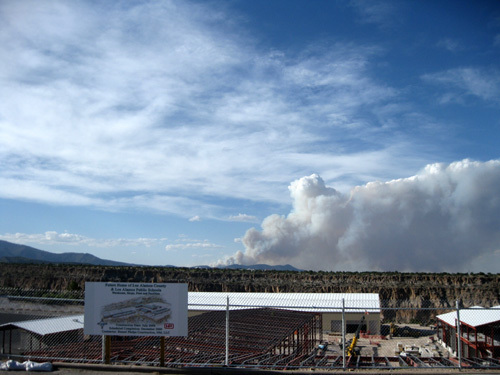 It's sunny and warm and there are cooling breezing on the three mesas upon which Los Alamos is built. 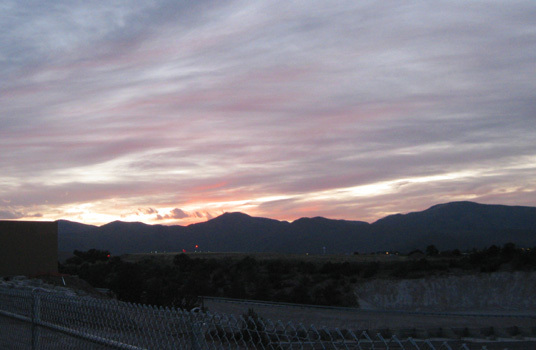 Last night there was a colorful sunset over the mountains. After giving up our trip out West last summer we are more appreciative of being out here now. 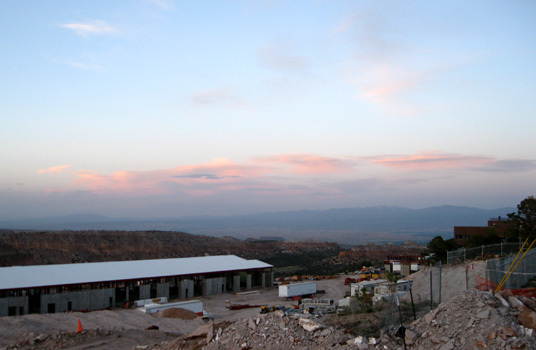 We're parked in an official Los Alamos County RV camping area just east of town, high up on one of the mesas, with great views west toward Los Alamos and the Jemez Mountains (above), south toward the Los Alamos National Laboratories and Bandelier National Monument, east toward the Santa de Cristo Mountains (in the distance below), and north toward the Santa Fe National Forest. We also have some entertainment here. We're near the end of the runway to Los Alamos' little airport and get to watch small planes (no noisy jets) land and take off. And down in the canyon below us is a beehive of activity as crews construct several large buildings (below) for the city and the school system. On weekdays we can have fun "supervising" their activities from our vantage point. This site is a bit unusual in that it is a large paved parking area. It doesn't have designated "camp sites." You just park wherever you want. A large Class A camper is parked farther from the road in a corner of the lot next to the DeColores Restaurant, which is open only on weekdays. If we decide to stay here all week, and if those folks leave, we might move from our shady spot next to the road to their spot. This place has its advantages. It is inexpensive and close to town. We have great TV and cell reception (including a broadband internet connection). Our current spot is very handy to the RV dump and fresh water supply. The downsides are no grass for Cody, no privacy, and the traffic might be noisier on weekdays. There are a couple other relatively inexpensive camping options in the area that we want to check out tomorrow. The county has another site near the Parijito Ski lodge. 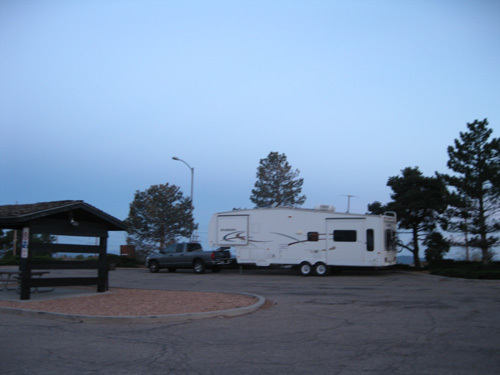 Bandelier also has campgrounds. We don't know if either place is suitable for our camper until we eyeball them. Google Earth isn't much help in this regard but it does clearly show the large parking area near the start/finish of the Jemez Mountain race Jim is running on Saturday. The RD and his assistant say we can move there on Thursday or Friday for race weekend, which is great. It is great to be on the road again! We have lots of plans for races, visiting friends and family, and sightseeing in the next five months. We'll probably be in every state from the Rockies west except Oregon and Washington.